The Twister is the world’s fastest leaf trimmer, equipped with the industry’s most powerful vacuum along with proprietary blade geometry to deliver the closest cut possible without damaging your product. 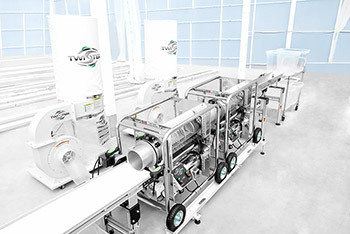 Its unique, scalable engineering allows for back-to-back tandem use to notably boost productivity, comfortably accommodate large batches and allow for operational growth. Distinctive rotation technology makes the Twister adaptable for use on a broad variety of plants. All new dry tumbler option allows you to quickly clean up dried flowers and buds faster than ever while maintaining a gentle and clean cut for excellent finished product. Much faster than trimming by hand, and excellent at turning annoying small flowers into profitable product! Combining multiple T2 trimmers in-line can increase trimming performance. *The estimates above will vary by plant type, flower size, and the angle the trimmer is positioned in. These are only estimates, your experience may vary. The wet tumbler or the dry tumbler. Select what tumbler you would like to come standard with your T2 above. QuickClick™ technology ensures ultra fast, extremely precise blade adjustment (.0009” / .023mm per click). 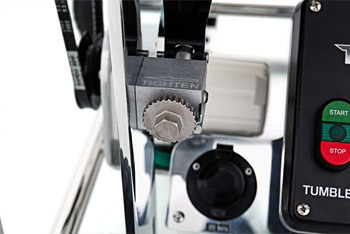 Easy-to-use tumbler adjusters raise or lower the cut height, providing maximum control over the look and feel of the finished product. Large, durable 9” pneumatic wheels ensure smooth and effortless movement over rough terrain. The low profile Twister T2 Leaf collector is the most powerful vacuum in the industry, allowing greater hose lengths and extended intervals between cleaning. 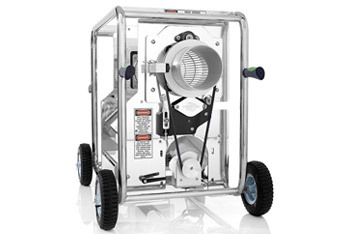 The heavy duty fan-cooled motor has a continuous duty rating for commercial use. The 80 micron filter bag ensures maximum airflow for extended periods while the balanced aluminum impeller keeps noise to a minimum. The extra thick 3mil collection bag ensures no ripping and odor when disposed of. Built-in circuitry protects your investment from misuse. The T2 tumbler’s electro-polished surface provides an effective non-stick coating, while the 50-slot design ensures maximum cutting area. 304 Stainless Steel ensures maximum strength and durability. Lightweight removable hopper allows for maximum control over processing speed. Precision urethane rollers maintain accurate tumbler roll. Designed for back-to-back tandem use with a second T2 Trimmer for even greater performance gains. Add Twister Feed Conveyors, Quality Control Conveyors, and Rails to dramatically increase productivity and process more product faster. 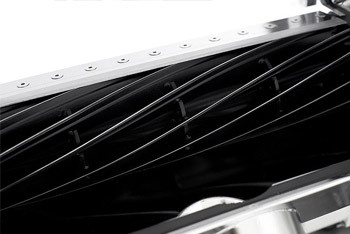 Tubular chassis provides unrivaled strength and protection. It also allows the machine to be rolled upside down for easy cleaning. 11 StaySharp™ self-sharpening blades are maintenance-free and perform 19,250 cuts every 60 seconds. Quick-release tumbler block makes switching out dirty or plant-specific tumblers a breeze. Watertight components allow for complete high-pressure wash down. Industrial 3-phase motor control circuitry offers thermal protection of motors. Super bright LED’s alert user when motors are in operation. Large extended stop button for quick shutdown. Nema 4X enclosure keeps everything watertight and corrosion resistant. Multiple grease points ensure blades last a lifetime.